Our campervan hire and car rental pick up locations are in the main centers (Adelaide, Alice Springs, Brisbane, Cairns, Darwin, Melbourne, Perth, Sydney) where all the best looking campers are - making it super easy to travel wherever you’d like through our fine land. Who wants to spend time hanging about in an office when you’re on holiday, especially after a long flight? An Australian campervan holiday is all about enjoying amazing sights and sounds, you don’t want to lose that time scratching your head about how to flush your loo. Our campers take any guess work out of it and lets you enjoy the sunsets ... or torrential downpours ... in comfort. 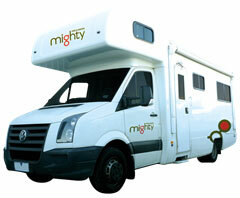 Superior motorhome facilities at a Mighty great price. 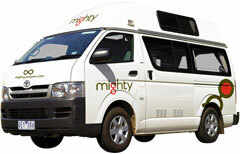 Hire the Double Up 4 berth motorhome in Australia today. Microwave yourself some popcorn in this super roomy campervan that sleeps 2. Includes a handy toilet and shower so you’ve got everything you need. Great for those travelling in groups or those that want a bit more room. Features top and bottom bunks so you have a slumber party for up to 4. 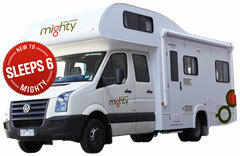 Sleeps 3, more headroom for your early morning stretch. Grill up a feast then clean-up is sorted with a sink on the inside. Ultimate in 4wd campers. Automatic transmission, 4x4 functionality, 2 x Roof-Top Tent, Slide out kitchen facilities, luxury and strength of a Mercedes-Benz. Class 4wd Camper - 4WD for the open road. 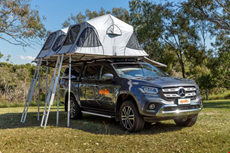 Fully automatic, robust 4WD tough free-standing Darche tents to provide a quality, flexible 4WD experience. Australia 4wd Rentals and 4x4 hire. Our 4WD's provides real outback comfort for 2 to 5 persons. 4wd campers sleep in the backor camping or rooftop tents. 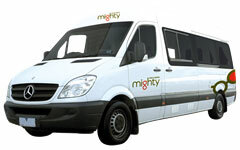 These small, compact and large car hire options are cost effective vehicles to hire and offer return or oneway rentals for 5 people. We also have 8 seat people movers for that large family or group of friends to travel around the cuntry and enjoy the vast Australian landscape.